I love B’Twin bikes. They’re astoundingly well priced. They’re designed — and often manufactured — in Europe. And it’s obvious that a lot of thought has gone into their design and specification. Even the models that don’t quite hit the highs have something to recommend them. Take this Riverside 7 trekking bike, for example. The headline attraction is clear: for £599.99 you get an unmatchable spec. There’s a rear rack, Suntour NCX suspension fork, Shimano dynamo hub powering both front and rear lights, kickstand, mudguards, Shimano Deore/XT triple chainset, even a set of SPD-compatible clipless pedals. And for anyone who thinks that hydraulic rim brakes are a new invention, the Magura HS 11 sets found here have been around for donkeys’ years. In the parlance of the car showroom, this baby comes fully loaded. Even the German-made aluminium frame has some special details, not least the through-frame routing for rear brake hose and derailleur cables. It also comes with a lifetime warranty. The finish is short of the very best — the graphics have been applied rather than painted — but all in all, it’s a very handsome machine. And there’s a lot of it. From the saddle it certainly feels like a big beast too. It’s stable and the ride on flat or moderately bumpy paths is perfectly pleasant with the Suntour fork doing its job. But what’s good on the flat isn’t so impressive up hill, and if you start climbing out of the saddle you’ll find the fork bobbing and sinking beneath you. Luckily, a handlebar-mounted fork lockout lets you disable the suspension, but you’ll have to switch it back on again when you’ve stopped climbing because in fixed mode the Riverside 7 tends to crash over road imperfections. In fact, the crashing over bumps and the sagging under weight are indicative of the Riverside 7’s other problems. What the B’Twin saves you in terms of money, it makes up for in sheer mass. This large-sized version weighed in at a bulky 17.4kg or 38lb on our scales. I know trekking bike fans can get a bit defensive when talk turns to weight but, really, 17.4kg is a whole lot of bicycle. You could argue that with the decent Shimano triple chainset and incredibly assured brakes, the extra weight isn’t an issue. And in the flatlands of Europe where these bikes sell by the truckload, it’s probably not a problem. But in the laudable quest to make the ultimate trekking bike package, I think things are over-engineered and over-specified just a tad for British tastes. What would I change? That fork is a start. With judicious use of the lockout it works fine, but why not cut out all that and go for Suntour’s excellent Magnesium Swing fork that we saw on the Roux G8 (CA July 2013) with its shorter travel and light construction? 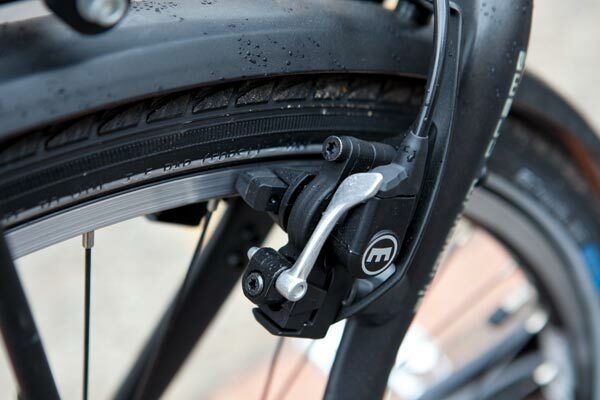 I really, really love the Magura hydraulic rim brakes, and if you’re planning on a heavily-laden cycle touring adventure you’ll be thankful for their progressive and very effective performance. 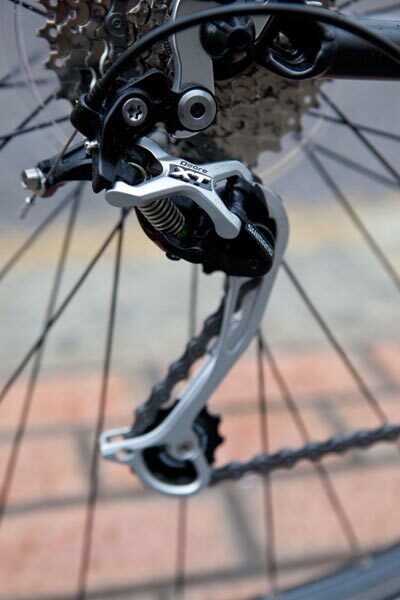 But for anybody else a set of V-brakes would save weight and be just dandy. 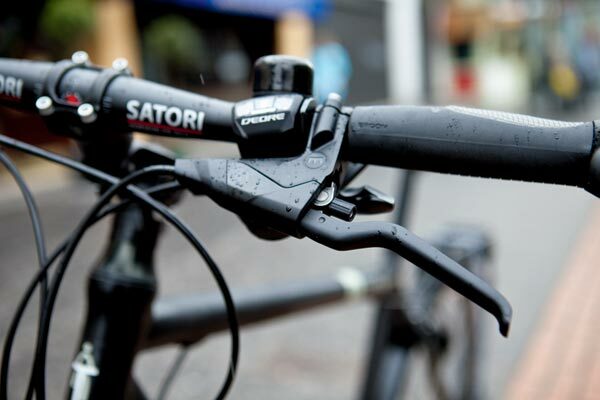 Even little things like the adjustable but chunky stem could be swapped out for something simpler. Let me put it this way: I enjoy 1980s stadium rock with its big hair, big choruses, big fireworks, big-chested groupies — indeed there are some realms where excess is best. 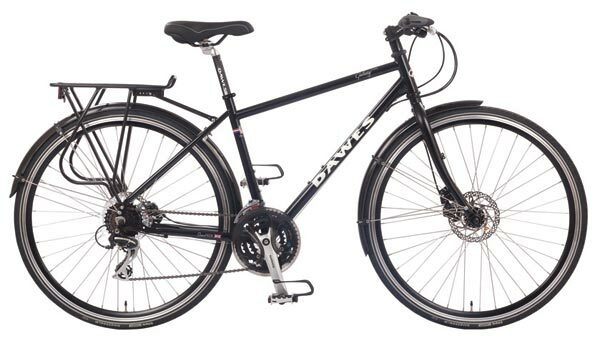 Proving that Brits can knock out a trekking bike to match any Continental brand, we really loved Dawes’s new Galaxy Cross when we tested it back in the April issue of CA. 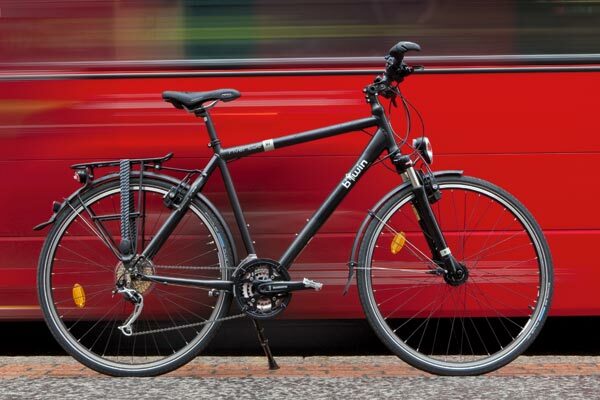 While it might come with flat bars, it retains many of the qualities of its drop-bar Galaxy touring brethren. The surprisingly dynamic steel frame feels great, and the mechanical disc brakes are plenty strong enough. It might not have quite as many accessories as the B’Twin, and the Shimano drivetrain isn’t quite as posh, but then it’s almost 2kg (4.4lb) lighter and a real joy to ride.